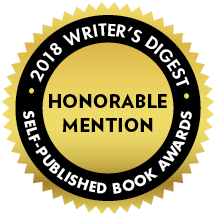 Unhaunted: A White Crow Mystery, has been awarded an Honorable Mention in the Genre Fiction category for the 2018 Writer’s Digest’s Self-Published Book Awards. According to the notification email, there were over 2,300 total entries in 8 categories. Not too shabby. Especially considering this novel started as a short story that just kept growing and growing … despite all my efforts to keep it in the realm of short fiction.